The main thing I wanted to change was my cleansing routine, as I usually stick to cleansing balm or oilier options in wintertime which aren’t the best choice in the warmer months on my skin. This winter I tried the Lush Let The Good Times Roll (£6.40 / 100g) cleanser and I really liked it and very appreciated the fact that they decided to stop making it only as a limited edition in wintertime since I think this can be great in the warmer months as well, as this helps a lot in keeping oil at bay and lightly exfoliate the skin in the meanwhile. I love using this every other day as a morning cleanser to remove every little residue of what I placed on my skin the night before – it also leaves your skin with a smooth lovely texture, a beautiful radiance and smelling delicious like fresh baked cookies. As for the rest of the week’s mornings and evenings I decided to test the Mario Badescu Enzyme Cleansing Gel (£12.31) which I only got a few days ago and so I can’t say much about it, but as soon as I read about its formula, I immediately decided I was going to love it: containing papaya extracts which are natural AHAs, this lightly exfoliate over clogged pores and leaves the skin super fresh. I love that it’s a cleansing gel as my oilier skin always loves gel formulas, and so far I’m really enjoying the refreshing feeling and the super fresh and clean scent. I’m remaining faithful to the La Roche-Posay Effaclar range this summer and in particular I’m loving the La Roche-Posay Effaclar Astringent Micro-Exfoliant Lotion (£8) and the La Roche-Posay Effaclar Duo [+] (£10.33). I’ve talked about these two a lot on here, but I still think they’re a great combo and amazing products for anyone who suffers of acne or has acne prone skin but don’t want to apply anything too aggressive. The former is a chemical exfoliating toner containing BHAs which are my best allies against acne, while the latter is a phenomenal serum on my skin which fight acne, clogged pores and acne scars and has the most lightweight and neutral texture. On the acne front I’m also trying the Peter Thomas Roth Max Complexion Correction Pads (£24.95) which contain both AHAs and BHAs and 2% of Salicylic Acid which is such a great ingredient for anyone who is trying to get rid of acne. I’m not a fan of the peach-y alcohol scent which physically bothers me, but I’m liking using these pads twice a week or when I see my skin needs help against blemishes and I find these are really nice and helps a lot in reducing acne appearance. As regards hydration, my main concern is the eye area which is always a bit dry and for that I’m still using the Botanics 80% Organic Hydrating Eye Cream (£8.99) and the Caudalie Polyphenol C15 Anti-Wrinkle Eye and Lip Cream* (£26) of which I talked in this post recently, but both are lovely in fighting my under eyes dry patches and I can’t be more grateful for that. The former is great in the morning being so lightweight that absorbs so quickly and it’s perfect to go under the makeup, whereas the Caudalie offering is perfect for the evening as I like to leave it on overnight so that it has all the time to sink in and deeply hydrate the skin. From the same Caudalie range I’m trying the Polyphenols C15 SPF20 Anti-Wrinkle Protect Fluid* (£29), a super lightweight hydrating face lotion which goes on very smoothly and not only has anti-aging properties but also SPF20 so it’s perfect for summertime and to go underneath my makeup. Lastly being that pale girl I am I always try too look more alive in summertime by using a self tanner and recently I’m really liking the Clarins Radiance Plus Golden Glow Booster (£15.80) which is a light self tanning serum to be mixed with your usual face cream or lotion that build a natural gradual tan. I’m still using all the products I mentioned in this post as well and if you suffer of eczema you may be interested in reading it. As for the rest I’m really liking this routine and can’t wait to test everything out properly and report back. 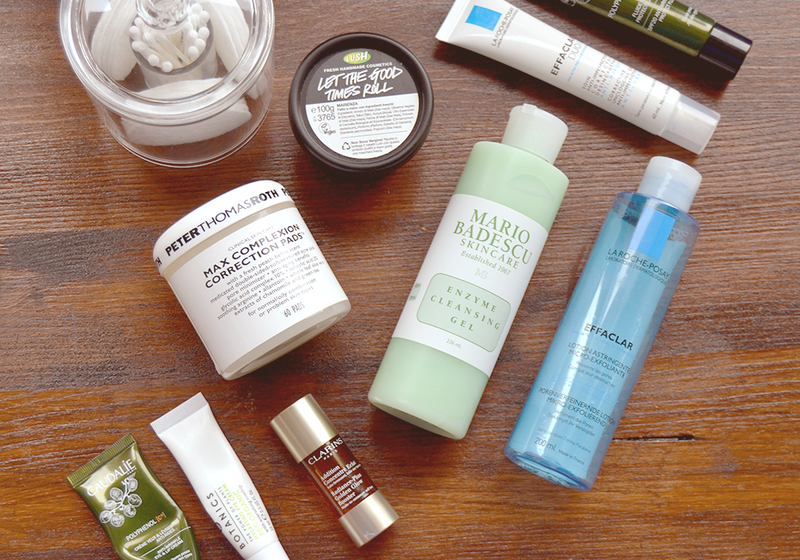 Does your skin need different routines in summer and winter?